I suppose this will be the Grand Finale, equivalent to the icing on the cake. In this episode we will discover the ancient wisdom that has been hidden in our English bible that decodes the mysterious Alpha and Omega that we find in the book of Revelation. The foundation for Alpha and Omega can only be found in the Hebrew script according to the Hebrew understanding. It is a beautiful truth that has been stripped from our bibles because mankind lacked understanding of its meaning. Where it is found and who it is referring to makes it an important truth to uncover. When we understand that in all eternity there has only been one time ever that the Father and the son experienced a separation, and it was for us. Indeed our sin came at a cost, not one we had to pay but one that was paid for us. (Mat 27:46) And about the ninth hour Jesus cried with a loud voice, saying, Eli, Eli, lama sabachthani? that is to say, My God, my God, why hast thou forsaken me? When we consider this then we can have a greater understanding about why treading His blood underfoot has such a steep penalty. It is our sin that put Yahushah on the Cross and we need never forget it, nor excuse it by returning to the sin that caused his death to be necessary. Heb 6:4-6 For it is impossible for those who were once enlightened, and have tasted of the heavenly gift, and were made partakers of the Holy Ghost, (5) And have tasted the good word of God, and the powers of the world to come, (6) If they shall fall away, to renew them again unto repentance; seeing they crucify to themselves the Son of God afresh, and put him to an open shame. We should never forget that the aim for believer’s is completion, we are called to be holy as He is holy. We are expected to remove the filthy garments of the flesh so that we can walk in the Spirit of God. Too great a price was paid for us, salvation is far from free, its just someone else had to pay the price for us to experience the freedom of it; just as a seed has to die in order for us to eat of its fruit. The Word (H853) was removed 7,302 times. When we look at the Ancient Hebrew Characters that make up the Aleph Tav we also see something. 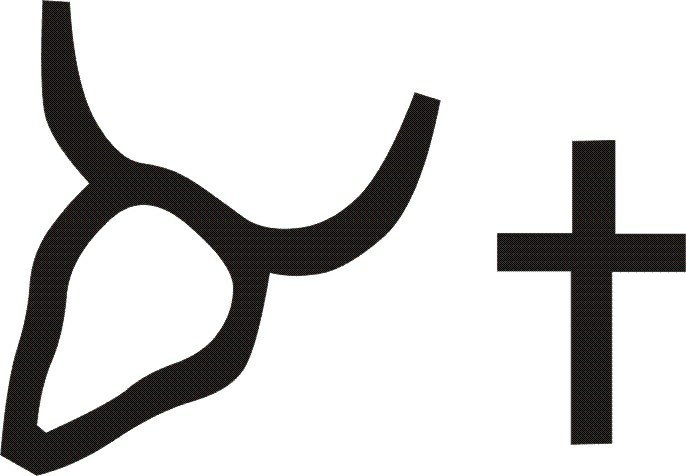 We see that the Aleph ( ) Tav ( ) is the Strong Sign, or Strong Covenant. This brings such a great insight as we consider the many times scripture tells us that the word is a sign. (Exo 13:16) And it shall be for a token upon thine hand, and for frontlets between thine eyes: for by strength of hand the LORD brought us forth out of Egypt. (Deu 6:8) And thou shalt bind them for a sign upon thine hand, and they shall be as frontlets between thine eyes. (Deu 11:18) Therefore shall ye lay up these my words in your heart and in your soul, and bind them for a sign upon your hand, that they may be as frontlets between your eyes. In Exodus 13:15 the children of Israel were instructed to keep the Passover as a sign. The blood of the spotless lamb would be a sign unto them. Just as that lamb’s blood was on the wood post upon the door of their homes, so also was our Lord Yahushah’s blood upon that piece of wood that was pushed into the ground. In Deuteronomy what are they being instructed to bind as a sign upon their hands, and as frontlet’s between their eyes? The word, and again in chapter 11 it is His words that we are to lay up in our heart and in our soul, and bind them for a sign upon our hand and as frontlets between our eyes. The Aleph Tav, the word and our keeping of it in our hearts, and minds, sanctifying it in all we say, think, and do, is the sign which reflects who we belong to. Now most of us would have no problem seeing how Yahushah fulfills the one coming on the cross as we celebrate and remember his sacrifice either as a Messianic or a Christian, but many don’t see how the Ox represents him. Remember Hebrew is not just symbols as is English but each character has a character, as well as has a numeric value. The numeric value of the Aleph is one as it is the first character of the Hebrew alphabet and the Tav is the last character of the Hebrew Alphabet, which should bring to mind this scripture. Rev_1:11 Saying, I am Alpha and Omega, the first and the last: and, What thou seest, write in a book, and send it unto the seven churches which are in Asia; unto Ephesus, and unto Smyrna, and unto Pergamos, and unto Thyatira, and unto Sardis, and unto Philadelphia, and unto Laodicea. This in essence is a redundant statement because as Aleph and Tau are the first and last characters of the Hebrew alphabet so also is Alpha and Omega in the Greek. Although, we should know that as John was a Hebrew that he would have been speaking in Hebrew which would mean if written in Hebrew it would read I am Aleph and Tau, the first and the last. Yahushah came as the sign ( ) of the covenant, but shall return as the strong ox ( ) that shall rule with a rod of iron in his grand finale. Hence, the first will be last and the last was first. We have completed the series on There’s Just Something About That Name. I know that with Yah there is always sooo very much to learn and I look forward to the new things He will teach me about himself and I look forward to sharing those new things with you. May YHWH bless every reader, May He make His face to shine upon every reader and give you Shalom (peace). In the Name that is above every name that is named the Great Deliverer whom Moses said we must hear, Yahushah (Jesus) Ha Maschiach (Christ). All Ancient Hebrew Characters provided by Ancient Hebrew Research Center. This entry was posted in Ancient Hebrew, Identity, Name of God, Spiritual Health and tagged Aleph tav, Alpha omega, Ancient Hebrew, bible lesson, Name of God, Names of God on March 30, 2015 by NLLEx. The setting of this scripture and the proclamation that is being stated concerning what we will call YHWH is based on a future prophetic event. It is clear as you read the chapter because the events mentioned have not yet happened in biblical times, nor in our time. It is referencing a time when like the Prodigal Son the children of the Most High will return to Him. They will turn away from the pagan gods that they have served and be true only to him. As we have discovered there are ways that YHWH revealed himself to his people that in most cases were specific and unique to that individual. As we see in the case of Abraham who articulated his experience in God in a way that we don’t see evident in the lives of other followers. As we have pointed out in previous episodes that this is significant and prophetic. Likewise this prophecy clearly reveals that the people who will encounter this particular experience and call YHWH their righteousness will reach a pivotal point in their life where they will witness the hand of God move in a way that no other group in times past, could relate to. YHWH like in the time of Moses is going to do a new thing and as in the time he did so with Moses we choose which side of that new thing we will take part in. We can either be on YHWH’s side and witness the miracles from the land of the living, or we can be with those in the rebellion against God and find ourselves swallowed up in the pit of the earth. YHWH gives us opportunities to escape hell we would do well to take them. Interesting thing is if you have e-sword and you look at this in the KJV+ version of scripture you won’t see all these characters. You have to look at it in the interlinear bible in order to see the full word here. Hebrew reads from right to left so the first character which is tsade ( ) means “path” or “side” as it is the picture that looks like someone on their side, “straight, just, or right”. This character depicts one who walks in a straight path. 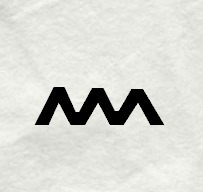 The second character is dalet ( ) which is the picture of a tent door and means to “enter or exit” or to “flow”. The third character is quph ( ) this is the picture of either the back of one’s head or the sun on the horizon. The meaning of this character is sun, revolution, circle, and horizon. It can also mean time or condense. The fourth character is nun ( ) which is a seed sprout which means continue, life, or seed as the life of anything starts from the seed. The fifth and final character is waw ( ) this character is the picture of a nail peg and means to establish, secure, or add as all of these are functions of a nail. When we put the letters together we see that righteousness is when the straight path which enters and exits the horizon continues to establish or secure. In my final episode of There’s Just Something About that Name we will look at the name that sums it up from A to Z, so to speak. We will look at the Aleph Tav which appears over 7,000 times in the Hebrew Scripture, yet not once in our English bible. We will discover the meaning of this hidden word and why it is the foundation for everything not hidden that we find in scripture concerning God. For the invisible things of God are clearly seen by the things which he has made, even his eternal Godhead. (Rom. 1:20) I hope you have enjoyed this series as much as I have been excited about sharing with you the things Yah has been showing me. More importantly I hope that you will begin exploring your own adventure studies and sharing it with others as Yah empowers you. This entry was posted in Ancient Hebrew, Identity, Name of God, Spiritual Health and tagged Lord, Righteousness, Tsidkenu, YHWH on March 26, 2015 by NLLEx. In this episode we will discover more about the God who is there (Shammah). Isn’t it awesome to know that we don’t serve a God who is far off or who cannot identify with us, but rather we serve the God of the universe who loved us so much that he became one of us just so that he could save us from ourselves. When I think of YHWH’s great love for us it makes it easy to walk through what feels like land mines in my life. Especially when you feel as if you are one word away from losing it, it is the word of YHWH and his presence that makes enduring the challenges of life easy. Let’s discuss the background behind where we see YHWH described as YHWH Shammah, which appears in the book of Ezekiel. Let me paint the picture for you, Ezekiel is describing the layout of the land that belongs to YHWH and how he will distribute that land to each tribe. As you read the layout and the dimensions of the property you see a vivid picture of the cross of Messiah with the altar of God being in the very center or heart of it. Much as where the heart of Christ would have been as he was positioned on that cross standing up into the ground. Only this time Ezekiel is not showing us our Savior being crucified, but rather reigning from his land in the midst of his people (the church). There are over 200 references with both YHWH and Shammah appearing in the same scripture, however, only one standing out as connecting YHWH to being the God that is there. However, in the places that you do see them both appear many reference YHWH’s presence or name being in a specific place. This is very important for us as believers because that is where we want to be where God is. Remembering that like our father Abraham we are still seeking a city whose builder and maker is Yah. (Heb. 11:10) Where we are is not where he is taking us, but we should always be kingdom minded and kingdom representing wherever we are. Just as I don’t stop being an American just because I visit Italy, you don’t stop being a child of God just because you are not in the place where he will make his name to abide. We are pilgrims here and as long as we think that way we won’t get too caught up in what we have here. We won’t start digging wells and making claims but rather we will recognize that this is a temporary location that we inhabit on the way to something greater then where we are can take us. The first scripture where we see the word Shammah used is in Genesis 2:8. I encourage you to read the entire forty-eighth chapter of Ezekiel, there are some amazing pictures foreshadowing Christ at the heart of his people depicting a landscape having the measurements which is in the shape of a Cross. No article can do justice to the Word of God, at best my greatest desire is to cause you to hunger to get what God has waiting for you there. Now let’s look at the characters used here in Ezekiel 48 because the interesting thing here is that the Strong’s number H8033 is normally spelled with two characters but in this text it is spelled with three. 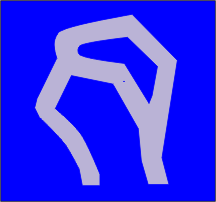 The first character sheen ( ) is the picture of two teeth and means to consume, or destroy as this is what we do when we eat. 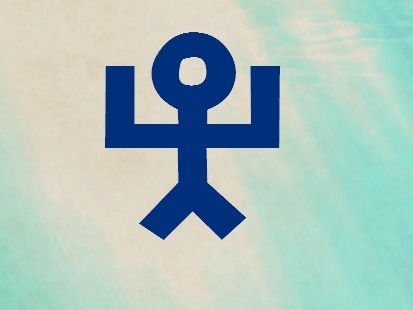 The second character is mem ( ) which is the picture of water waves which refers to liquid of any kind and chaos. As the Hebrew people associated Noah’s flood with chaos. The final character is a hey ( ) which is the picture of someone with their hands up looking as if they are beholding something greater than themselves. We see this when we praise or when someone surrenders. This character means to behold, to look, or to see. Now the AHLB provides an interesting definition for this term. 1473) ( ) ac: Breathe co: Breath ab: Desolate: The wind, or breath, of someone or something is its character. This definition reflects another illustrated picture of the Father and the Son being one. As Yahushah is the breath of God (word) made flesh, reflecting in human form the character of the Almighty we know that where he was, was where the kingdom was. Hence to have the breath of God in us is to have the character of God within us. This is why it was when Yah breathed into mankind he became a living soul. (Gen. 2:7) This being the most fitting place to see YHWH Shammah is where the description of the King in his Kingdom amongst those in whom the breath of life resides in them surrounding him would provide the most vivid picture of what the Kingdom of God is. In the next episode we will look at YHWH Tsidkenu our Righteous God found in Jeremiah 23:6. How awesome it is to learn more and more about the King of Glory and to know that His breath resides within us. This entry was posted in Ancient Hebrew, Identity, Name of God, Spiritual Health and tagged Name of God, Shammah, YHWH on March 5, 2015 by NLLEx. In this episode we will discover the God of all peace. This is an encouraging revelation when we are faced with the constant assaults we are faced with during our day. We can take comfort that our peace cometh not from the world nor can it but comes from the God of peace, YHWH! In the sixth chapter of the book of Judges we encounter Gideon who is threshing wheat near a winepress so that the Midianites don’t spot him. He and his people had been taken captive because of their idolatry and sin against Yah. In the midst of his chores he encounters an Angel of YHWH and after a miraculous event Gideon finally accepts that he has been entertaining an Angel of Yah and becomes afraid. The Angel comforts him by saying “peace unto thee.” Now in verse 24 we see that Gideon names the altar that was built wherein his offering to Yah was consumed was called YHWH Shalom. While this phrase only appears once in scripture the word Shalom appears in 208 verses a total of 236 times. From H7999; safe, that is, (figuratively) well, happy, friendly; also (abstractly) welfare, that is, health, prosperity, peace: – X do, familiar, X fare, favour, + friend, X greet, (good) health, (X perfect, such as be at) peace (-able, -ably), prosper (-ity, -ous), rest, safe (-ly), salute, welfare, (X all is, be) well, X wholly. How many reading this can use some Shalom in your home? How many would like to invite the presence of the Almighty into your space to bring forth wellness, safety, happiness, his friendship, health and wealth? In the next episode of There’s Something About that Name we are going to get into one of the major Prophet’s book Ezekiel and discover YHWH Shammah. This entry was posted in Ancient Hebrew, Identity, Name of God, Spiritual Health on February 22, 2015 by NLLEx. In this episode we will take a look at El Olam, the Everlasting God that Abraham called on in Genesis 21:33. There are five scriptures where the word God (H410) and Everlasting (H5769) appears in the same scripture and this encounter with Abraham is the only one where the two are put together as a name. So we see that the strong hand towards the established word equates to His everlasting presence. However, to narrow this list down let’s look at the particular words we are looking for which is “El Olam” and we do that by searching in Esword the two Hebrew numbers at the same time which is “H5769” and “H410”. 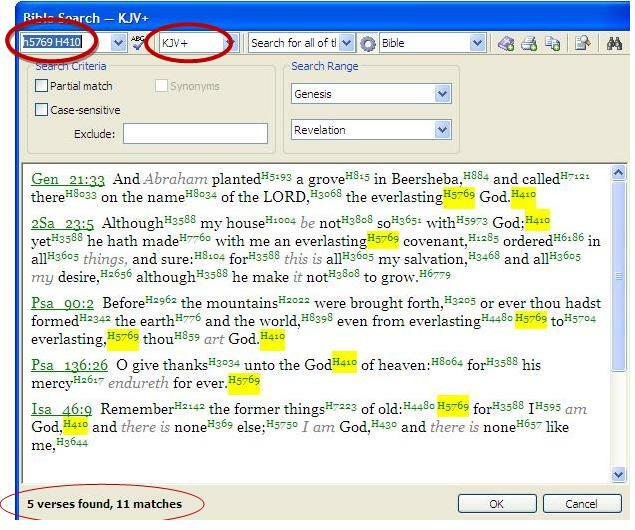 Make sure that KJV+ is indicated in the field next to the search query. The order you put it in won’t matter since the query will look for its use together in any scripture regardless of order. Also make sure you add a space between the two numbers. If you have done this correctly this is what you will find. Now as you look at the scriptures that come up notice that only one clearly identifies “everlasting” God. In 2 Sam. We see everlasting is describing the covenant, in Psalms 90 it is referencing God’s unending nature, in Psalms 136 it is referencing God’s mercy, and in Isa. 46 it is referencing remembering what He did. This brings us to the second word we have studied so far that occurred once in scripture and Father Abraham was the one who had this specific encounter. The revelation I perceive the Father is showing us, by revealing Himself to Abraham in these unique ways is that Abraham is like a type of starting over. He is to Israel what Adam and Eve were to the world. Only with Abraham and Sarah do you see Yah starting this unique story that carries forth through the totality of scripture. He gives them a new name representing the new family that he is going to repopulate the earth with. No longer is Abraham identified with Adam, but instead with the Father. He gives them the promise that their seed would be compared to the stars in the sky and the sand of the earth, enumerable. He even brings forth seed from him in this unique way, when Sarah was past the years of childbearing meaning this thing he is going to do man couldn’t make it happen only Yah could do this. We still serve the same God of wonders, what miraculous picture of God’s image is he painting in your life? What promise has He made to you that you are still waiting to see the fruition of? Is anything impossible for him? I think not for our God is eternal, everlasting, perpetual, without end. Before we wrap up this episode let’s see what the Ancient Hebrew reveals to us about “Olam”. 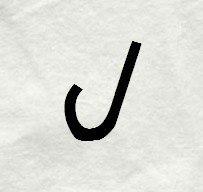 This is a four character word in Hebrew. As you know we read Hebrew from right to left and the first character is one of an eye. Which means “to see”, “to know”, “to watch”, all the things we do with our eye. The second character is a nail peg which means “to establish” to “secure” or “to add”. The third character is a shepherd’s staff marking “authority”, “shepherd” or “towards” as a shepherd leads the sheep with his staff towards a pasture. The last character is water waves which means “liquid” or “waves” as well as “chaos” as many Hebrews associated Noah’s flood with chaos on the land. When we put the characters together we see that knowledge establishes the Shepherd’s word (as soundwaves connects us to the word). In the next episode of There’s Something About that Name we will explore YHWH Shalom the God of all true peace. This entry was posted in Ancient Hebrew, Identity, Name of God, Spiritual Health and tagged Abraham, Ancient Hebrew, bible lesson on February 10, 2015 by NLLEx. In this episode we will uncover the meaning behind a name used in a Psalm that has been treasured, made into a song, and has been memorized by thousands next to the Lord’s Prayer. 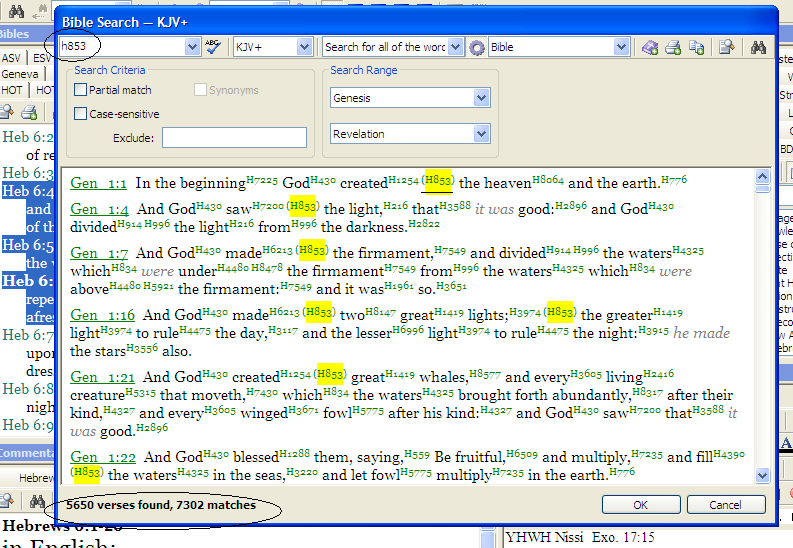 The term appears throughout the text of scripture in 142 different verses. In Psalm 23:1 YHWH reveals himself to us as our Shepherd, and though this term for Shepherd doesn’t first appear here, it is the first time that we see YHWH and Shepherd being directly stated. However, I would venture to say that a deeper understanding of what a shepherd does and who a shepherd is will be clearly revealed through the myriad of verses that uses the term. There are two rules that I hope you see consistent in this series and number one is the significance of finding the original meaning of the words we are looking at so that we can ensure that we have a proper understanding of their meaning. The second would be the importance of understanding its meaning from its origin. In other words, looking at how the word was first used and understanding that we build from there as our foundation. The same reason we go back to the root of a word and as more is revealed we add to the original, not change the original. If we really understand that then we would see that YHWH operates in cycles, and that He doesn’t do away with a covenant as YHWH never has a bad idea that needs revamping, but because of His great love for us he adds addendum’s to the plan so that His goal of having us with Him becomes more attainable. He never lost sight of His original plan which is to have a people after His own image and likeness. Our failure has consequences, thus Adam who had one rule, that when broken, led to Moses having six hundred thirteen more instructions. Why more instructions? Because the goal is so that we being unholy might have a means by which we can draw near to a Holy God. This means He sanctifies us through His word so we can get the filth of the world off of us and draw near without drawing our last breath. Just as one could never expect to get clean by rejecting water, one should never expect to receive life by rejecting the water of life, Yahushah. Thus without Yahushah you can’t come to the father. Hence, He is our Passover Lamb, not our Easter bunny, Santa Clause, Tooth Fairy, and his love has nothing to do with a Valentine. Coming to the Father by any means other than the one He made available results in strange fire and one need only to study Nadab and Abihu to understand the severity of coming without the Word to the altar of Yah. (Lev. 10) There is only one way to the Father, not my way or your way, but His way and either we respect the rules of the Father’s House or we won’t be allowed in it. I know it seems like I have digressed far from the topic, but I really haven’t. As our topic is about YHWH our Shepherd. If we understand that a Shepherd functions as one who has a responsibility to care for something of great value, then we realize that following someone means that both parties have a role in the relationship. Sheep are expected to follow as Shepherds are expected to lead. If anyone on either side of that partnership fails to fulfill their role then there will be loss. This tool is the most important reason why everyone who loves the Word of God and is serious about leading others to the fountain of living waters should have a PC. This print screen is of E-sword a powerful tool for your PC that has thousands of dollars worth of information available for FREE!! If you get the Awakened Church version not only will they send you a disk but it will be loaded with all sorts of tools including dictionaries like the (AHLB), bible versions, timelines, pictures, encyclopedias and more. However, this program is not Mac compatible. It’s impossible to follow the Shepherd if you don’t know what he said, no more than someone who speaks no English is likely to understand your instructions. They don’t even charge for postage but I would highly encourage you to donate money to them they are serious about getting the word out to as many people as possible. I was only able to show you a sample of the search as my screen wasn’t large enough to contain the entire list, but I wanted you to notice that when you look it up by the Strong’s number you will see that the same number produced different words other than Shepherd. Which is why it is important that you look up words in the bible based on the original word used (Strong’s number) not by the word translated. This is how you do a word study when you study according to the Strong’s number rather than the English translation. The Shepherd is only responsible for His sheep. No shepherd is required to keep any sheep other than those that belong to Him. This is very important because as we stated earlier the Shepherd/Sheep relationship is based on mutual acceptance. A sheep that doesn’t want to be kept has the ability to leave. The Shepherd goes after His, He is coming back to get His, and like David to take out the wolves, bears, lions, and Goliath’s that make merchandise of His sheep. The Path of Peace, I think it is important that we notice something here that would become a pattern concerning Abraham and His righteous seed. Notice, that when it came to him fighting with his nephew Lot, he would rather defer and separate then cause strife and contention. Abraham wasn’t caught up in stuff that is something serious to consider. Loving and shepherding someone doesn’t necessarily mean that you keep reigns on them to make them stay with you, but rather that you protect and always lead them in the way they should go. Simplifying the role of a Shepherd would be that his responsibility is to protect the sheep from danger and to lead them to food and water. If you know that you are unable to successfully do that than your responsibility as a Shepherd is to delegate it to someone who can, because your job is to do what is in the best interest of your sheep, not yourself. Thus the Shepherd lays down his life for his sheep, as a husband is called to lay down his life for his wife and children. It’s an awesome responsibility that is not based on what you can get out of the relationship but rather what you should give. As we read however, we will find that women were also responsible for being Shepherds. We see that Rachel also kept her father’s sheep. Scripture teach us that in Yah there is neither male nor female. (Gal. 3:28) When the Father gives you authority to do something then you can do it, because he enables you to do it. In many cases families only have daughters and no sons and especially in those cases it becomes necessary for women to step in. In this passage we see that Yahushah connects being the shepherd to being the door of the sheep. A door has a twofold purpose, it is a line of defense against predators, and a source of security for the prey. As a walled fortress to a city provides a source of comfort to its inhabitants so also does the word of God provide comfort to us, as a wall of life that provides life to those within it. We also see here the characteristics of a good shepherd versus those of a hireling (bad shepherd). A good shepherd, like David, like Yahushah, lays down their life for the sheep. As the sheep knows the shepherd’s voice so also does the Shepherd know those that are his. Defining terms Hebraically make it much easier to discern whether or not you are dealing with shepherds or hirelings, because a shepherd from a Hebraic point of view is based on what they do, not what they know or what degrees they have behind their name. Your name is based on your ability to keep your word, and your name will not be greater than your word. If your word is worthless your name is worthless. That is Hebrew thinking. That stated now let’s look at the Hebrew word that makes up shepherd. The first character is the picture of a man’s head and has the meaning “Chief”, “leader”, “head” as all describe the position and authority given to Adam (mankind) from the Creator. The second character is the picture of an eye and carries the meaning “to see”, or “to know”. The last character means to “behold”, “to reveal”, or to “Look”. When we put pictures together we see the Shepherd represent the revelation of the man that is watching. We know YHWH is the One who watches us and there is nothing hidden from his sight. Therefore Yahushah represents the best example of what being a shepherd means. Finally, we receive a foreshadow of the work and position of a Shepherd when we go to the Creation week and review the choice Yah used to focus on, on the day he created mankind, the ox and the lamb. Both of these animals represent the work of a servant and like David the ox represents a strong servant able to conquer lion and bear to protect his Master’s sheep. Then there is the lamb which represents the selfless sacrifice that would give his life to protect His Father’s sheep. Though David was a fierce warrior as it related to the enemy of God’s people he was also a compassionate and loving King that won the heart of His people. We see this same spirit demonstrated in Messiah Yahushah. The greatest example of a Good Shepherd has been walked out before us and is the Example the Father has given to us in His Son, Yahushah. Next episode we will uncover YHWH of Host, the God who when Isaiah met him became speechless before him. YHWH is indeed worthy of hearing Holy, Holy, Holy, as HE alone is God Almighty. This entry was posted in Ancient Hebrew, Name of God and tagged Ancient Hebrew, bible lesson, Biblical Patterns, Name of God, YHWH Ra'ah on February 1, 2015 by NLLEx. In this episode we will look at YHWH our healer which appears in Exodus 15:26. After undergoing a fourteen year journey to health restoration this aspect of YHWH’s character continues to be one of the most vivid ways that He shows up in my life. While divine health is best and that is what I strive to obtain, experiencing YHWH as healer is an awesome reminder of who I must put my trust in because He has never failed me. This is the root meaning for the word Rapha which means Heal. Now as I begin to look further into the word I was reminded of a scripture in Psalms 40 that gives us a hint for understanding scripture in the context in which it is written. How do these two characters reflect the revelation of what our Saviour Yahushah did for us? It is clear as we read the prophet Isaiah who received amazing prophetic insight into what Yahushah would come and do. As a plant that is crushed and bruised as a means of remedy for our sickness, all typifying and pointing to the work Yahushah did on the cross they stand even to this day as a reminder of Him. It is by His bruising and from His wounds that we are healed. All of this just from two characters that make up the root of this word, however, the completion of this word requires us to look at one more character. 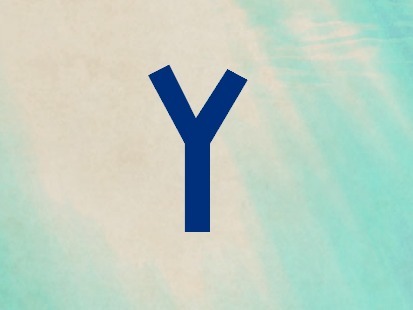 Now we have already stated that the first two characters ( ) and ( ) means “man open” we see that the word that stands for “cure”, “heal”, “physician” ends with (a) a character that means “strength” or “first”. This reminding me of one of the old hymnal’s which beautifully reflects the meaning of this word, “Power in the Blood”. For indeed there is power in the blood of Yahushah and most definitely that power includes that of healing as Isaiah 53 pointed out to us. 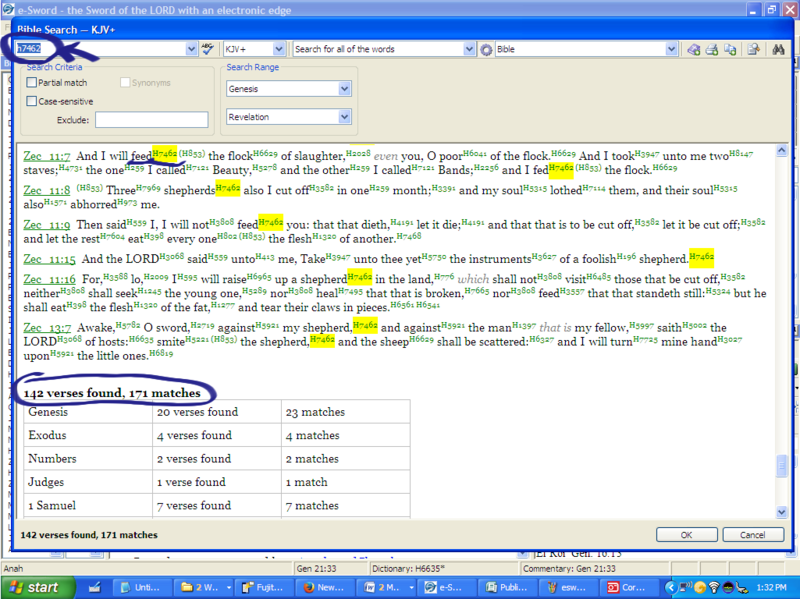 The strong’s number for is H7495 and this word appears 68 times in 63 verses in the Old Covenant writings. This word appears twice in Genesis however, the context doesn’t specify that YHWH is the Healer until we see Him revealed as such to the children of Israel through the prophet Moses in Exodus 15:26. It is clear that YHWH healed Abimelech in the first occurrence of the term, however, it is specifically stated in Exodus 15 that he is identifying himself to the children of Israel as YHWH that healeth thee. Yet, even in that context Abimelech was only able to receive the benefit of YHWH’s nature as Healer through the intercession of Abraham. Hence, the prayers of the righteous availeth MUCH!! (1 Peter 3:12; James 5:16) Abimelech would be able to say amen to that. While we see in Exodus it is plainly stated who will heal us, Isaiah 53 reveals descriptively who it is that will do so. We of course, as stated earlier know this is a prophecy concerning Yahushah who like a plant that is crushed to produce medicine for us was fulfilled in our loving Savior Yahushah, who died for us, that we might have life. Once again proving the medicine of the word is healing balm indeed. Next time in There’s Something About that Name we will uncover the meaning behind YHWH Nissi, our banner of victory. This entry was posted in Ancient Hebrew, Identity, Name of God, Spiritual Health and tagged Rapha, YHWH on December 27, 2014 by NLLEx.